1 Sauté the onions in the olive oil over medium-high heat until translucent. Turn off the heat and let it cool. 2 When the onions are cool enough to touch, use your (clean) hands to gently mix them in with the bison burger meat, and add everything else. Do not overwork the meat, it will result in a tough burger. Just gently fold it until the onions, sage, salt and pepper are well mixed in. 4 Grill or fry the burgers on medium heat, about 6-7 minutes per side, less or more depending on the thickness of the burger and the heat of the pan/grill, or until the internal temperature is 140°F for medium rare, or 160°F for well done. A note on internal temperature. If you are getting the ground meat from a source you trust (like Sierra Meat and Seafood) that does their own grinding on site, or you grind your own meat, you can safely cook the burgers rare or medium rare. Otherwise you’ll want to cook the burgers until well done. Don’t press on your burgers while cooking, and keep the flipping to a minimum. Let the burgers rest about 5 minutes before serving. 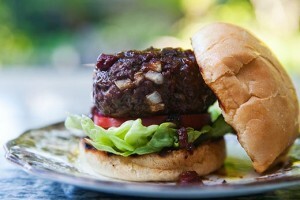 Serve the burger with lettuce and tomato, topped with a smoky barbecue sauce.